With the ID Maker® Zenius System 1-Sided, you get fast and professional prints at an affordable price. Ideal for smaller organizations, this introductory ID card system gives you all the tools you need to design and print your perfect IDs—including the industry’s most user-friendly card creation software, ID Maker® 3.0—while keeping maintenance as simple as possible. It’s great for low to medium volume prints on single-sided PVC and adhesive cards. Questions about photo ID badge systems? Talk to a System Specialists now by live chat or calling 1.866.438.4553. ID Maker Essential 3.0 Software Easy-to-use basic software for professional ID creation. Printer Protection Bundle - ID Maker Zenius Keep your ID Maker® Zenius Printer in tip-top shape! This protection bundle includes a warranty extension for a total of five years of total coverage, a cleaning kit, and a FREE protective printer case. System includes: ID card printer, Logitech C920 HD web cam, mini tripod and white photo backdrop, 200 blank PVC plastic cards, 200-print YMCKO printer ribbon, and a printer cleaning kit. Includes ID Maker® Essential 3.0 software. Weight: 15 lb. 6 oz. Excellent product to use for any size company. No matter if you need 10 or 5000 badges created the program is simple and fast. 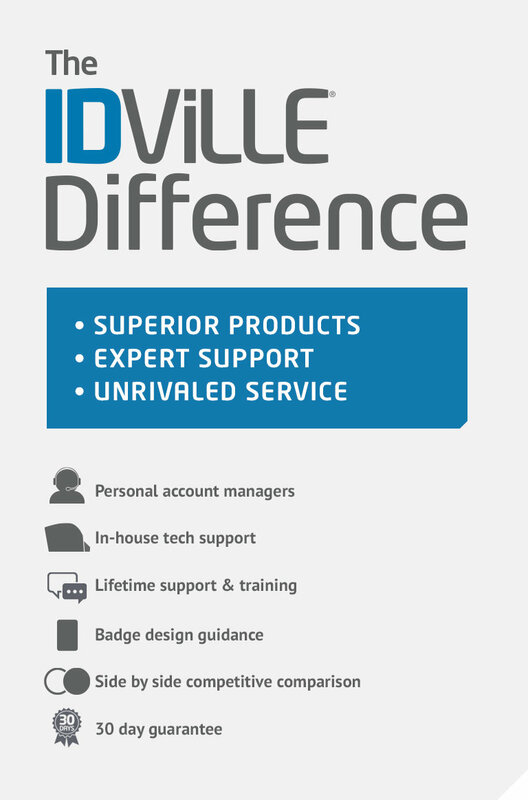 Highly recommended to any company looking to imply badges to become more professional. I use this printer to make ID cards for our team members. I only print 1-5 cards at a time. I always forget to unsleep the printer before I print a card, but I love that the pop-up reminds me right away. Very good customer services before - during - and after the sale!! We are using the product to create ID badges for our entire school district. The software is easy to use and comes with lots of stylish backgrounds. Very Happy! The IDmaker printer is excellent and just reordered the printing film. Good product all the way around and is doing exactly what we wanted for our business. The systems works great for company ID badges and Prox cards! If you have a dedicated computer so that everything stays connected, I would rate it a 5. It is less user friendly when moving a laptop to use with system IDs are needed. I use the Zenius to make name badges for my new employees. The name badges look professional and are easy to make.